TSIA’s 2015 Knowledge Management Survey is NOW OPEN! I’m pleased to announce that TSIA’s 4th annual Knowledge Management Best Practices Survey is now open, and will remain open until midnight August 31st. This survey is open to the public–not just TSIA members–and includes some questions to cover all service areas, including customer support, field service, professional services, and more. Using content management systems or generic data warehouses instead of traditional knowledgebases, and relying on intelligent search to create the taxonomies and find the right content. Mining communities for knowledge, as well as allowing customers to contribute knowledge or suggest edits to knowledge in self-service systems. Culture is playing a huge role in the success of KM, and especially as KM projects spread beyond technical support, convincing employees to collaborate instead of hoarding knowledge may take some work. I’d like to give special thanks to DB Kay & Associates and eGain for their helpful input on this year’s survey. Thanks for taking the time to read this post, and please find 5 spare minutes to complete the survey! Recently I’ve had a few conversations with support managers and executives about how hard it is to find the right people to work in customer-facing roles. One word that keeps coming up is empathy: many new employees simply don’t have any emotional connection to the customer or their problems. CSAT surveys say the agents sound bored, uninterested, and not invested in helping solve the problem. I have experienced this myself, and as a customer it is not fun being treated as if I’m keeping them from reading their all-important Twitter feed, or interrupting them watching a video on Netflix. The worst is when you explain your problem and hear an audible sigh. If you are struggling to hire employees that are empathetic with customers, consider using this test or something similar as part of your screening process. 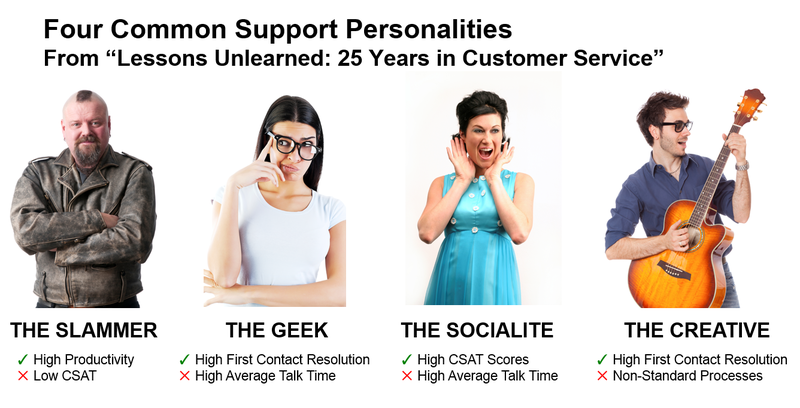 Yes, I realize phone support employees are not looking directly into the customer’s eyes (unless you are one of the vanguard companies offering video support), but my opinion is that high visual social intelligence scores would translate to empathetic listening as well. As a little experiment, it would be interesting to ask a group of your employees to take the test and capture their scores. Include some agents with the very highest and very lowest CSAT averages and see if this hypothesis holds water. If anyone tries this experiment, I’d love to hear the results. Defining KM is a moving target. 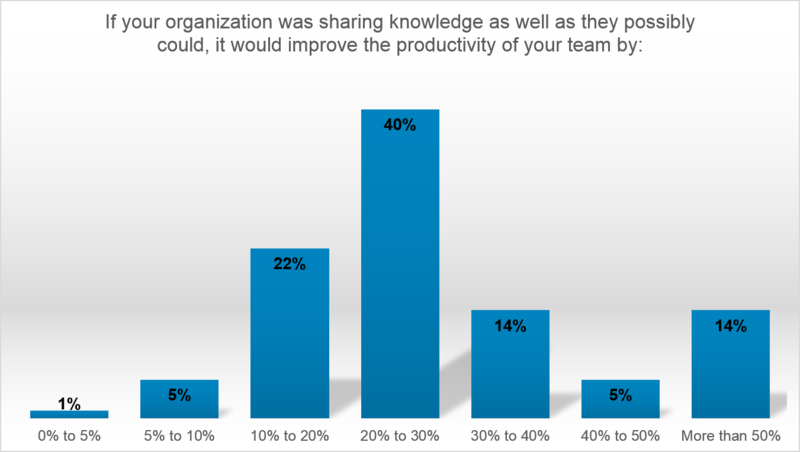 As usual, knowledge management dominated many of my 1:1 meetings. At one point I lamented to Françoise Tourniaire of FT Works, a long time TSIA partner and KM expert, “It used to be so easy–you bought a knowledgebase and you were done!” Today there are multiple technology and process areas converging: knowledge management and knowledgebases, content management, social interaction including crowdsourcing and collaboration, and expertise management. Today I spend more time talking about enterprise search technology, such as Coveo, than I do about knowledgebase tools. There is so much content across the enterprise and in online communities, and few companies are doing a good job of fully leveraging it to help customers. Today when companies launch a KM project, the first 6 months is usually spent just defining that that means, and what project scope makes sense. You can’t boil the ocean, but being fixated on a single knowledgebase will also not serve you in the long term. Reducing overhead on communities. Another common theme I heard is that online customer communities, which are increasingly seen as the primary source of product information for more customers, is taking a lot of internal staff to manage and moderate. There were early success stories from companies like Novell who successfully transitioned the majority of moderation activities to “power” customers. These customers are treated like royalty, given free trips to user conferences and featured in expert panel discussions. And it is a win:win for the customer too–if they are anointed a super user by a vendor, they have their pick of administration jobs. But I heard from multiple companies with successful communities that customers love the forums, but their employees were still providing most of the answers. Prioritizing moderation duties in addition to inbound assisted support phone calls and emails is a complex juggling act, and sometimes community responses suffer. Telephony is an ongoing challenge. I’m the first to admit I am not an expert on voice/telephony systems. At Forrester this was covered by a different group than enterprise applications, and though call centers may be the primary users, IT still owns the product selection at most companies, meaning TSIA has never had much luck landing voice partners, since the business users aren’t the ones driving the deal. But that doesn’t stop the flow of questions. I continue to hear that ‘best of breed’ onpremise voice platforms are far too expensive for smaller companies, but there are too many unexpected outages and poor quality using cloud voice platforms. I also had some questions about what bleeding edge features to look for when planning “the call center of tomorrow,” especially in the area of video calls and social media integration. Everyone’s PSA needs are different. Professional Services Automation (PSA) has become a frequent topic in my conference 1:1 meetings, and I find that just about everyone I talk to has different priorities. I define PSA as a platform containing 3 modules: resource management, project management, and project accounting, and the reason for the PSA project can be in any of these areas. Resource management is at the root of many of these conversations, from boosting utilization rates to forecasting talent requirements a year in advance. CRM integration is often a big topic as well–how can I get more visibility into the pipeline and start influencing what PS projects are being quoted? But I also talked to companies who were primarily focused on better management and visibility into projects, usually because they are seeing project milestones slip and margins degrading, and want to find out why–and find out early enough to take corrective action. And there’s always someone struggling with the billing side, with customers pushing back for more detail and asking for discounts after the fact. I also had conversations about social media monitoring, tools for customer success, and building multichannel customer engagement strategies. Hopefully everyone got something out of these meetings–I know I sure did. If you are planning to attend our next TSW conference in Las Vegas in October, please consider booking a 1:1 meeting with me, and I look forward to seeing you there! And as always, thanks for reading! At the close of last week’s Technology Services World, TSIA held its sixth annual Vision Awards at Service Revolutions competition. This event is a services technology spin on American Idol, with companies having a short window to give a live demonstration on cool and innovative tools or processes that improve service for customers. The audience votes live for the “cool factor” of each presentation, and the highest audience scores determine the winner. The master of ceremonies for Service Revolutions is TSIA’s CEO JB Wood. There is also a judges panel who asks questions and make sometimes snarky remarks after each presentation. This was my sixth year serving as a judge, and it is definitely the highlight of the Spring TSW conference for me. I was joined on the judges panel this year by Charlotte Baker, CEO, Digital Hands, and David Sudbey, EVP, Customer Success, Genesys. There were nine contestants in three categories: Service Practitioners (TSIA members, i.e., service organizations of tech companies), Commercial (established technology vendors), and Startups (emerging technology vendors). A check for $10,000 is presented to the winner in the Startup category. Service Practitioner: Blackbaud. Blackbaud presented an expand selling initiative called “Upserve.” Upserve is a philosophy that introducing an offer for additional products or services to a customer is actually beneficial to the customer, providing it is in context of the customer conversation, with a focus on the benefits or outcomes of using the additional purchase–not making a sale. Upserving customers becomes a standard part of service interactions, not only boosting service revenues, but with positive customer feedback and increased product consumption. Commercial: Knowledge Factor. Knowledge Factor demonstrated their Amplifire Learning Software, that leverages profound brain science to systematically deliver dramatically enhanced learning outcomes. With Amplifire, learners will acquire more information faster, remember it longer and recall it far more effectively than with traditional learning methods. I thought that Amplifire seemed to be using the same brain functions we hear about in gamification, making learning interesting and fun, but without gimmicks. Startup: Compellon. The Compellon 20/20 platform enables data analysts and business users to quickly and easily discover the truth hidden within diverse data sets. The result of 20 years of research in advance information theory, Compellon’s breakthrough analysis engine simplifies traditional data analytics by eliminating the trial-and-error methodology of testing data against multiple statistical models. The platform is capable of automatically discovering, learning and adapting in dynamic data environments, empowering companies to make fast and well informed decisions. Congratulations to the winners, and a big thanks to Charlotte Baker and Dave Sudbey for joining me on the judges panel! #1. Optimizing Support Delivery, Featuring Insights from Motorola. Over the last few years, the role and expectations of customer support have evolved at an accelerating pace. While customer support often used to be viewed as a necessary expense and a cost center, for forward-leaning companies, it has now grown into a top customer retention driver and strategically critical function. More and more, customers come for the product and stay for the service. As customers’ expectations evolve, support and service has an absolute mandate to evolve as well. Ed Simon, technical support senior manager from Motorola, and Peter Zeinoun, director of products for LogMeIn Rescue, discussed the challenges of the ever-changing support landscape, the tremendous opportunities that new technology presents in meeting those challenges, and best practices for continuing the strategic shift in your approach to support. PS–check out this previous blog entry on a very cool video solution LogMeIn just introduced that will be presented in our Service Revolutions competition today! #2. Drive Content Sharing and Reuse Adoption with Workflow Integrated Social Knowledge. Cisco Technical Assistance Center with over 3,000 engineers in 20 facilities worldwide supports customers in 180 countries with 1.7 million cases annually. Cisco continuously evolves the way engineers think about knowledge through collaboration. We implemented an engine embedded into the workflow to capture and surface relevant content at the right time. Using an organic Social Knowledge Environment, engineers author content, post questions, curate conversations into documents, and reuse knowledge in various forms. We leveraged gamification methodologies to drive adoption with tailored competitions that recognized engineers’ efforts. Best practices also emerged from the user community, and the environment became the preferred channel for TAC to collaborate and publish content externally. As customers often requested access to Cisco knowledge to solve issues on their own, we built an algorithm to automatically assess the value of content, which triggers the external publication workflow, which resulted in over $10 million of case avoidance savings. Presenter: Fabio Bergamo – Services Business Architect, Cisco Systems. #3. It Takes a Team: Collaborate Your Way to Service Revenue Generation Success. It’s no secret that service contracts are the glue that binds together customers, partners, and manufacturers throughout the relationship life cycle. Failure to attach, renew, and retain these agreements can result in severe revenue losses–not to mention harmful damages to brand trust. That’s why manufacturers at the forefront in this space have recognized that it takes teamwork to ensure not only the most optimum business outcomes, but also the most optimum customer experience. From integrating disparate data sources to uncover unattached assets, to using extreme automation to expedite renewal processes, the value chain is reaping the rewards of working together like never before. In this panel discussion, three service revenue leaders–representing the manufacturer (Cisco), the distribution partner (Comstor), and the technology provider (MaintenanceNet)–will share their collaborative journey, explaining how, together, they’ve been able innovate and automate their way to service revenue generation success. Presenters: Scott Herron – CEO, MaintenanceNet; John Stone – Marketing Manager, Cisco Systems; Christopher Fender – Director Service Sales/Pre-sales Engineering, Comstor. #4. The Journey to Outcome-Based Service Offer Development. Calling all service marketers, service product managers, and service portfolio managers: This interactive “workout” session focused on the journey toward creating service offers that connect with customer business value in new and powerful ways. Parijat Sharma, director of customer success products, at Salesforce, and Julia Stegman, vice president, research, at TSIA, led an interactive discussion allowing attendees to learn from their peers and share their experiences. #5. Turning Your Community into a Profit Center. 2014 Jive Award Winner for Customer Engagement FireEye uses the JiveX external community platform to deliver mission-critical cyber intelligence updates to customers, while also providing a forum for peer-to-peer customer support and free security resources to the public. This multi-faceted community has deepened FireEye’s relationships with customers, lowered support costs, and provided a new way to provide a paid-for service, furthering its competitive advantage. Presenters: John Summers – Manager, Services Collaboration and Social Strategy, Fire Eye, Inc.; Cathy Won – Director Product Marketing, Jive Software, Inc.
Congratulations to all of these presenters, and thanks for taking the time to share your expertise with our members! Operational Best Practices: Essential “Customer Impact” Levers in Support and Professional Services. This session focused on important customer impact levers for optimal support and professional services performance. TSIA members discussed what best-in-class looks like, how to implement and manage those functions, and the impact they will have on customers and your business. This session covered key areas of support and professional services, and dug a little deeper into the “what” and “how” for each. Presenters: Tom Pridham – SVP & GM, TSIA; Manny Vilarino – Senior Manager, Advanced Services, Cisco Systems; Dayton Semerjian – GM, Global Customer Success & Support, CA Technologies. What Are the Key Initiatives and Practices Support Organizations Are Using to Drive Customer Adoptions and Business Outcomes? The rapid rate of change in the technology industry is forcing support organizations to look at their current processes, people, and products. The historic processes and measurements are no longer enough to drive the value customers are demanding, and support organizations are being asked to continue to provide traditional break-fix service but reinvent themselves as they do so. Companies are being asked to drive the highest levels of performance (financial, satisfaction, adoption, and loyalty). This session reviewed the new structures, processes, results, and metrics being implemented and measured, and shared industry averages as well as Pacesetter performance. Presenter: Judith Platz – Vice President of Research for Support and Success, TSIA. Expand Selling: Accelerating Revenue Growth through Efficient Selling Models and Motions. The concept of expand selling as a formal initiative is rapidly emerging in the technology industry. Companies are beginning to find ways to accelerate revenue growth with existing customers in a more formal manner, and to do so cost efficiently. Expand selling is different than landing a new technology sale with a customer, and involves more than just selling additional products and services to existing customers. Expand selling can involve helping customers achieve desired business outcomes with their existing technology, which is turn will lead to accelerated revenue growth at scale. To achieve this objective, we see the need for transformation across sales, services, and customer success, and for changes in how these functions interact with one another. This session explored the rapidly emerging concept of expand selling, and shares TSIA’s most recent research findings that can help companies navigate this important transformation. Presenter: Mark Middlekamp – VP, Research, TSIA. Customer Success: Leverage Product Usage and Consumption Analytics for Customer and Business Value. In this session, Tony Brucha, director customer success, and Roxana Fitzmaurice, senior manager, Global Enterprise Theatre (GET) accounts at Cisco WebEx, described the WebEx customer success function and the application of Usage Analysis Scorecards and Templates as part of the Lifecycle Account Management process (Onboard, Adopt, Expand, Renew). The Usage Analysis Scorecards and Templates are leveraged to increase collaboration platform adoption, lead generation, and upsell and cross-sell opportunities for some of Cisco WebEx’ largest customer accounts. Tony and Roxana described the usage data collected, the analysis and comparisons conducted by customer and industry verticals, and the adoption services activities undertaken with the customer which result in effective customer value, business reviews, and increased business revenue. Looking to Improve Product Adoption, Customer Satisfaction, and 97%+ Customer Retention? After seeing customer retention rates decline and experiencing many internal, resource-consuming, fire-drills to address customer issues, Imprivata took a bet and implemented a Customer Advocacy function. Customer Advocates are responsible for working with customers to drive end-user adoption of our solutions, understand deployment pain points, recommend solutions and best practices, establish ongoing communications with the customer, and function as a primary post sales point of contact. Internally, Customer Advocates operate as customer champions and orchestrate satisfactory outcomes across sales, services, and support. This presentation shared their approach for implementing a Customer Advocacy function as well as best practices and lessons learned, including: building the strategy and customer segmentation; hiring profiles and onboarding strategies; creating an integrated account team across sales, renewals, and customer advocates; establishing cross-functional account responsibility and collaboration; and measuring impact, including KPIs. Presenter: Laura Carson – VP Customer Advocacy, Imprivata. I’ll be back tomorrow to report the top attended sessions from today. Thanks for reading! Consumption analytics. 2014 was the first year this technology appeared in the survey, reflecting the emerging interest in customer success. These tools, which monitor how well customers adopt and consume technology, are now used by 26% of companies, nearly doubling last year’s adoption rate of 14%, and moving this category from Blue to Yellow in the Heatmap. Contract and entitlement management. Without accurate entitlement information, companies give away services for free to expired customers, and may not provide premium service levels to customers who have paid for faster response times. Adoption of tools to automate contract and entitlement tracking rose 12% to 66% in 2015. Field service scheduling and dispatch. The mobile revolution is having big impacts on field services, with field techs armed with mobile devices able to be more flexible with appointment scheduling. This is creating an opportunity for companies to upgrade their scheduling and dispatch platform to take full advantage of mobile capabilities. Adoption of field service scheduling automation grew to 54% in 2015, updating the category from Yellow to Orange in the Heatmap. Learning management systems (LMS). Automating learning can boost employee productivity, as well as help customers adopt technology and realize value faster. The shift to online learning means more companies are investing in automation for learning, with adoption of learning management systems growing to 70% this year. Mobility and video. Companies continue to invest in mobile and video solutions, not only enabling employees to be more productive, but also improving mobile access to corporate information by customers. Adoption of mobile and video solutions grew from 42% in 2014 to 56% in 2015, moving this category from Yellow to Orange in the Heatmap. Professional Services Automation (PSA). For the first time, PSA became a Red category on the Heatmap in 2015, with adoption by 76% of companies—up from 57% last year. This illustrates that more professional services organizations are moving off spreadsheets to manage their businesses with more sophisticated resource management and executive dashboards. Recurring revenue management. These tools, which automate the renewal process, first appeared in the Global Technology Survey last year, and this year saw the highest adoption gain of any category of the survey, increasing from 13% in 2014 to 46% in 2015—a full 33% rise year over year. However, the largest percentage of adopters are using home-grown solutions, which are unlikely to contain the sophisticated capabilities included in best-of-breed solutions, such as proactive alerts and trend analysis. Support scheduling/Workforce Optimization. These tools, which automate support schedules according to historic volume patterns, have not been well adoption by B2B companies, leaving managers to create schedules manually. Inquiries around these tools has been rising over the last year, and that interest has translated to higher adoption. For 2015, 43% of support organizations are now using some type of scheduling automation, up from 29% in 2014. 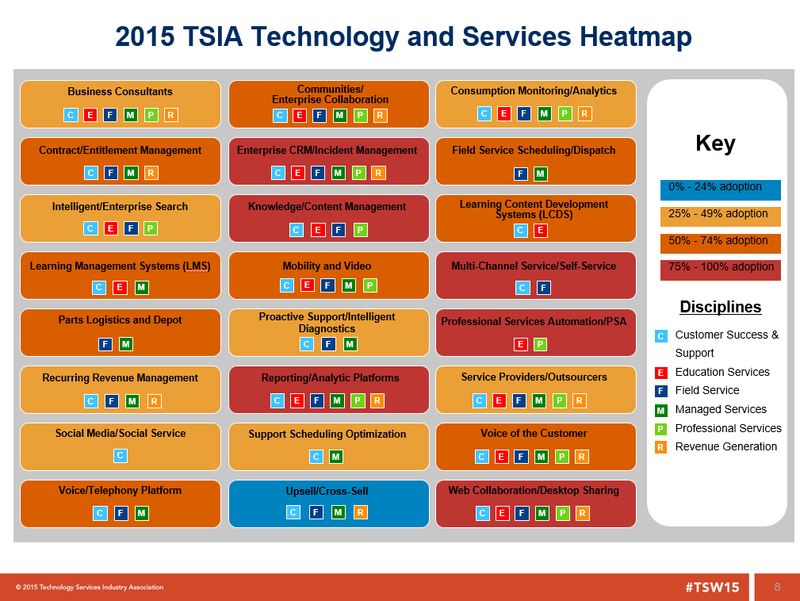 For additional information from the 2015 Global Services Technology Survey, including the full Heatmap report, top installed products or planned spending for 2015, see the individual adoption and planned spending reports for each service discipline, as well as the report listing top installed products in each category, on TSIA.com.